Summer equals heat and, in Ireland, sometimes sun! Most of us crave this break from the cold, but what about when the heat is just too much for our clothes and instead of staying cool we become sweaty messes?! That’s where hyperhidrosis treatments (a botox treatment to help stop sweating) and our summer special come in! Sweating is natural, it’s our bodies way of cooling us down with but with hyperhidrosis treatments our body’s cooling function tends to be hyperactive and produces too much sweat! Excessive sweating in more severe cases can be a sign of conditions such as thyroid problems, diabetes or infections so if you are concerned it would be worthwhile going to your doctor just to eliminate any other possibilities! Which Part of The Body Can be Treated For Hyperhidrosis? We sweat almost everywhere on our body however excessive sweat mainly bothers us on our underarms, our hair line and our hands. In Amara we can help with excessive sweat on the hairline and underarms. We can treat Hyperhidrosis with botox under the arm. By injecting Botox we stop the sweat glands from working which reduces sweat! Like most Botox treatments we inject directly into the area needed and it should take about 14 days until the Botox kicks in fully. The majority of people who receive Botox for Hyperhidrosis already notice a difference within the 2 weeks! For the hair it’s very similar we just inject along the hairline which then prevent sweat from ruining your hair! This treatment is also known as a Blotox. A Blotox (for your hairline) lasts an average of 4 months and costs €350. 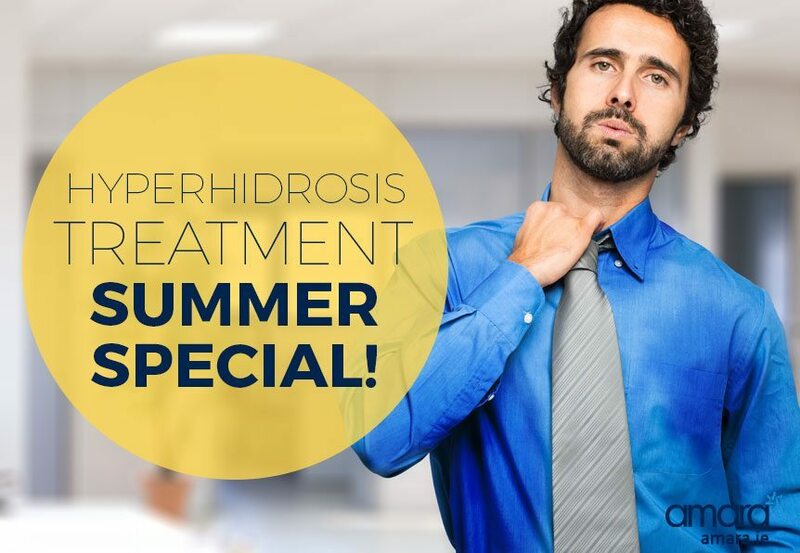 Usually underarm Hyperhidrosis Treatment is €700 however we have a Summer Special! From now until August 1st 2016 Hyperhidrosis treatments will cost you just €550! If you’re self conscious about sweating during the summer why not book in for a free consultation today? Give us a call now on +353 1 676 1074 or contact us online to find out more! I’m just enquiring to see how much it costs to get botox for the armpits to prevent sweating. Botox for Hyperhidrosis (underarms) is €700. I see you said it’s 700€ , I’m just enquiring is it 700€ each time you come back for Hyperhidrosis or is it less , and how often would you have to get it done ? Hi Ava, Yes that would be €700 per treatment. We use the original Botox® from Allergan which typically last 3 -4 months, however, some people may get longer out of it this would be entirely dependant on you.